The Italian parliament has become the latest major European legislative assembly to push for the creation of a Palestinian state alongside Israel, after a decisive vote Friday. However, deputies nixed a motion for the immediate recognition of Palestine. The proposal suggested the two countries should return to the pre-1967 borders, and share Jerusalem as the capital. Three-hundred voted for the draft, and only 45 against it. It followed the tenets of the document approved by the European Parliament in December. Just like that resolution, the vote has no binding power, as it is the prerogative of the Italian government to recognize Palestine. Another motion, proposed by the New Centre Right party and approved by the majority, said the renunciation of violence and reconciliation between the secularist Fatah and Islamist Hamas "will determine the conditions for the recognition of a Palestinian state." A more radical proposal submitted by leftist and opposition parties to immediately recognize Palestinian independence was handily defeated, with only 56 deputies voting in favor. Although at face value the parliamentary motion was seen as a booster for Palestine’s quest for international legitimacy, the results of the votes were criticized by Palestine and embraced by Israel. The Palestinian Liberation Organization (PLO) “welcomed” the initiative but said "it is unfortunate, however, that the resolution did not commit to the unconditional and official recognition of the state of Palestine." "Our independence is not dependent on the outcome of negotiations, mutual recognition or other preconditions. We are entitled to self-determination and to exercise sovereignty on our own land without permission from the occupying power." Contrastingly, the Israeli embassy in Rome, which previously warned against “premature recognition” of Palestine that “only encourage[s] Palestinians not to resume talks with Israel,” hailed the resolution. 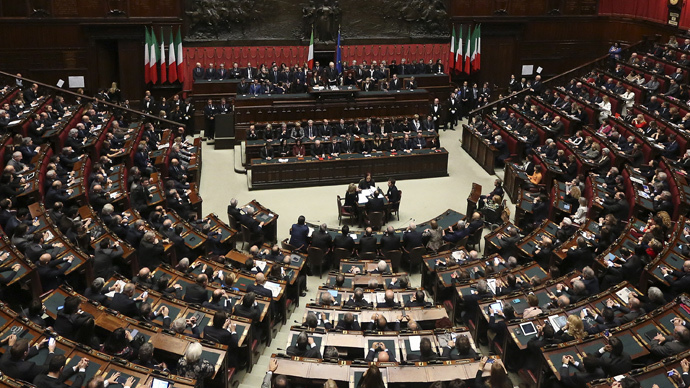 "We positively welcome the Italian parliament choosing not to recognize a Palestinian state and opting to support direct negotiations between Israel and the Palestinian[s] on the basis of the principal of two states, as the right way to pursue peace," it said in a statement. Following years of stalled talks between Israel and Palestine, punctuated by violent terror attacks and armed conflicts such as last year’s Gaza incursion, legislators all over Europe have been backing the notion of a new Palestinian state. Parliaments in Spain, the UK, France, and Ireland have passed differently worded symbolic proposals that call for a two-state solution, and a new status for Palestine. Sweden was the only country which officially recognized Palestine as-is, after a decision last October. Overall, the PLO says that 135 states – mostly in the developing world – recognize its statehood, though Israel disputes the number.